Am back in May with another exciting challenge !This month, I am guest hosting In My Veg Box, an event run by Nayna Kanabar of Citrus Spice UK. This month’s theme is Cauliflowers. Cauliflower – ”The kale of 2014, the budget-friendly superfood, the most underrated vegetable” is what the Huff Post,Canada mentions in a recent article about 10 health benefits of cauliflower. Did you know that Cauliflower is an aid to weight loss! Yes! That’s why its the new kale and tastes much better too, don’t you think? My favourite new way to use cauliflower creatively is by shredding it in a food processor and cooking it with some water in a microwave as a replacement for rice. Cauliflower is bursting with various vitamins like Vit B and C , potassium and phosphorous that can support your body’s repair and maintenance of the nervous system, immune system, muscles and bones. Its name is from Latin caulis (cabbage) and flower. A brassica, like cabbage and broccoli, cauliflower is a mass of tiny, tightly packed flower heads (called curds), which grow from a thick central stem to form a single, round head, cupped by green leaves. It has a firm, almost waxy texture, and a mild, delicate flavour. Most cauliflowers are white, but it’s also possible to find green and purple varieties, as well as the sweeter Romanesco cauliflower, with its distinctive pointed florets.The orange cauliflower is also rich in beta-carotene and vitamin A.
I tasted the orange and purple coloured variants of cauliflower for the first time a few years back and my love affair with the beautiful Romanesco cauliflower has only just begun! Did you know that the English call romanesco – broccoli, the French – cabbage and the Germans and the Poles – cauliflower. Some of the undecided place it somewhere between broccoli and cauliflower. Taking into account its shape, romanesco rosettes bring to mind the pyramids or minaret towers, the theory, that it fell out of a flying saucers would seem to be rather interesting. Acc to the BBC Good Food Guide: Like all brassicas, cauliflower smells very unpleasant if overcooked, so brief cooking is essential. With me and my hubster cauliflower and green peas bhaji made using a simple hand me down recipe from my aai (mother in Marathi, my mother tongue) is a firm favourite.I make it atleast once a week. 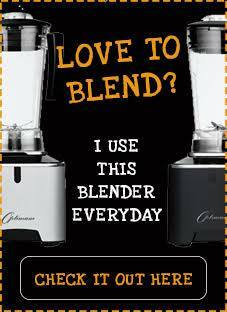 My aai, my sister and her kids love it too, we are a veggie friendly family that way! So get cooking,clicking and link up but first a few rules! I know , I know RULES.. But I promise the rules are dead easy to follow! Please prepare any vegetarian recipes using Cauliflowers and link your dish to the linky code below. You will need to enter the name of your dish, as well as the url of your blog. You must link this post to Sliceoffme and to Citrus Spice UK. Use of the logo is not mandatory but it helps to spread the word if you can use it. Archived entries are also allowed, only if they are re-posted and updated with this event link, as well as the Citrus Spice UK link. Recipes must be added to the linky by 31st May 2014. In the event of any problems with using the linky code, please email me your entry to fruitsnveg@yahoo.com. Please include your name, recipe name, url and an image no larger than 300 pixels. Thank you! Can’t wait to see variety of recipes that I am sure are possible with the humble cauliflower! Get Cooking Bloggers! 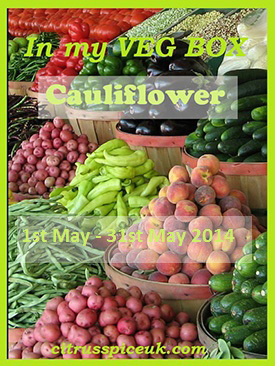 In my veg Box – Theme Cauliflowers – all entries. « Spicy Chorizo Pasta with loads of veggie goodness! Thanks Nayna for letting me host,am sure we will get some very interesting link ups! “The kale of 2014” – that made me laugh! Great challenge. I made a tasty cauli and chickpea curry a couple of weekends ago, may perfect that one to enter. I did not know that cauliflower was an aid to weight loss. We’re big fans, will bookmark to enter. It was quite a surprise to me too and a very pleasant one as we too love the vegetable dearly.Thanks Ren looking forward to see your entry! I do like cauliflower, though I like broccoli too. I haven’t yet tried this famous cauli rice, but I must get around to it as everyone else seems to have tried it. Will wait for you to Link up Fiona, agree totally Cauli Rice is yumm! Manjari, found you through Nayna’s page on Facebook through the challenge. Will post mine before the event ends. Thanks looking forward to seeing what yo create! 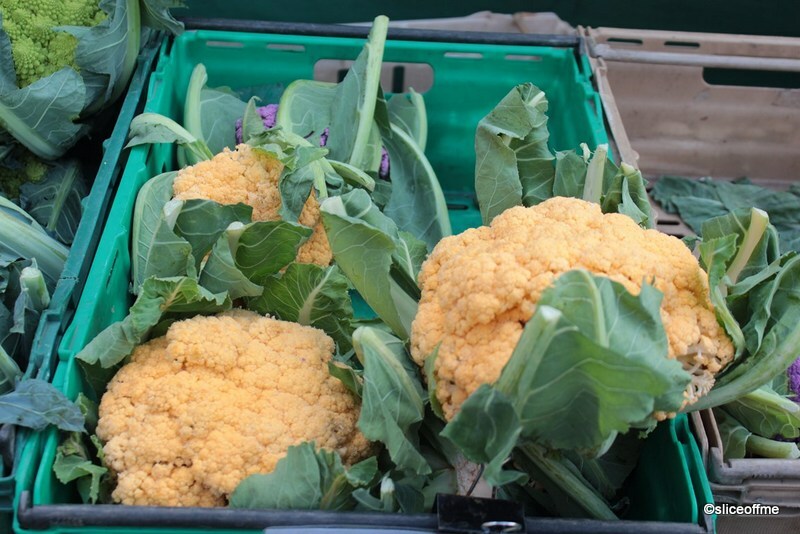 Thanks Helen , am glad so many varied creative entries have linked up this time!I loved your innovative idea of anchivies and shaved parmesan but am going to make the cauliflower risotto first with a crispy egg on the top!